Effort: Easy Pre-Prep time: 1-2 Hours. 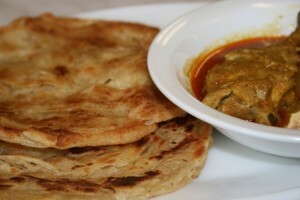 Bundu Paratha recipe by sajida at DesiRecipes.com. Make a hollow in the center and add an egg, salt and water and knead to a smooth dough. Now add oil in it and keep kneading well. Then cover the dough with a moist cloth and leave aside for 15-20 minutes. Then make balls from the dough. Take one ball, spread it a bit, then apply the prepared paste and re-roll and form it into square first and then again into a ball. Do the same to all the pairhas. Now apply a little oil on to each pairha and again cover and leave it for half an hour. Heat ghee in karhahi and with the rolling pin make thin parathas and deep fry them in hot ghee .